National Novel Writing Month (NaNoWriMo) is a fun, seat-of-your pants approach to novel writing – 50,000 words – in one month! Lawrence Clark Powell once said that “Writing is a solitary occupation,” but next month you can join a community of other writers and face your creative demons together. National Novel Writing Month is November and once again ArtReach St. Croix will be an official Write-In location. Start writing that novel you’ve always been meaning to write. 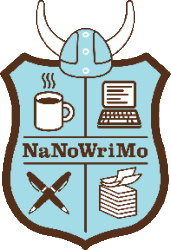 NaNoWriMo is just around the corner. Write toward the goal of 50,000 words. ArtReach St. Croix’s weekly write-in sessions will be each Monday night, from 5 to 9 pm, at the gallery (224 N. 4th Street, Stillwater MN). These sessions will give you a dedicated time and space for you to focus on your writing projects. ArtReach will supply the fuel (i.e. coffee) and healthy (and not-so-healthy) snacks. Joining us each week for a 7 o’clock stretch will be a yoga instructor to give us a few minutes of breathing and stretching exercises, as well as a local author to inspire us with their words of wisdom.